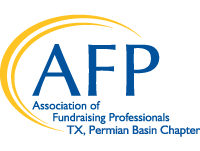 The Permian Basin Chapter of AFP awards two types of scholarships: The AFP of the Permian Basin Scholarship and the Chamberlain Scholarship. This scholarship is awarded at $500 for the International Conference and $250 for any other conference. The chapter should appoint a committee to disseminate scholarship application forms and select one qualified scholarship applicant. The Chamberlain Scholarship Recipient Reporting Form must be forwarded to IHQ by the deadline. The chapter is encouraged to allocate funds locally to provide additional scholarships or help defray expenses not covered by the $500 Chamberlain Scholarship Grant. The chapter must submit the Chamberlain Scholarship Recipient Reporting Form, along with the completed application form of its scholarship recipient, to the AFP Foundation for Philanthropy Scholarship Committee in order for their scholar to receive the grant. Program materials will be provided by the International Headquarters Office to all chapters. The $500 Chamberlain Scholarship will be paid directly to the International Conference registration and will not be sent to chapters. If a chapter chooses to extend additional scholarships, after a Chamberlain Scholar has been chosen, these ’Chapter Scholars’ are able to register at the reduced rate of $510.00 at any time prior to the conference, if the chapter has submitted the Chapter Scholarship Recipient Reporting Form to IHQ by the deadline. In addition to these criteria, the AFP Scholarship Committee encourages all participating chapters to consider diversity and financial need when allocating scholarship funds. Chapters may add additional criteria (e.g, whether to choose members or non-members,) if they so desire. Chapters are encouraged to match the Foundation grant with their own funds. If chapters have difficulty getting applicants who have never attended an AFP conference in the past, we encourage the promotion of this scholarship to new members who have recently joined the chapter. The AFP Foundation for Philanthropy appreciates the assistance of chapters in publicizing the Chamberlain Scholarship program through the local media.